MySpace, was the once darling of the Internet world, though interestingly followed a similar path to ruin on a somewhat comparable timeline to American Pie’s Tara Reid. Now both are back!Though it’s obviously only MySpace we have any interest in. Tuesday, the company, now owned by Justin Timberlake previewed a video of its redesign and frankly we were impressed. It seems that MySpace is looking to integrate with the current social media behemoths Twitter and Facebook in a similar manner to that of Pinterest and YouTube. The video of the social media re-release showed people finding people via Facebook as well as the posting of Tweets through a MySpace account – all very pleasant. Of course, as expected the social media site will be pushing integration with photos, videos and music playlists. And it also seems that it will be possible to create playlists from artists on the site with the playlist bar at the bottom of the page. We’re not sure whether integration to Spotify or Deezeris on the horizon – but it would make sense if it were. One of the more interesting features is the ability to add photos to music and playlists. This allows for a visual and also an audio representation of a specific happening and potentially could be quite cool. 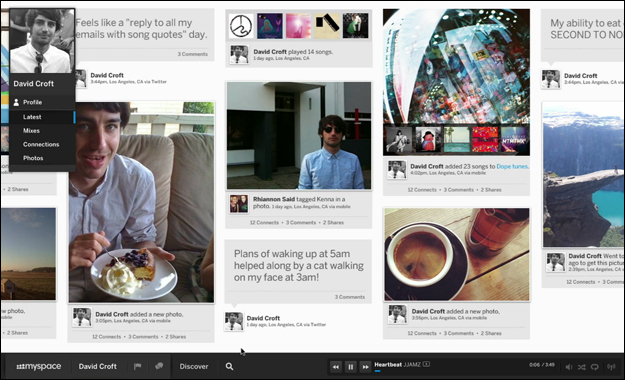 The dashboard or interface is a lot different to the traditional MySpace and takes a scrolling landscape like design. It also comes with a Pinterest like style with photo panels strewn across the screen and the ability to comment and share below them. Essentially, it’s quite floating but very attractive. The interface includes a status update box linked across numerous social media platforms – as you would expect; and also comes with a stream for shared content. There’s also a trending area for video, music and events. This could be potentially a great way to get to grips with new music and goings-on among friends and even further afield. It seems MySpace is being quite practical about the redesign and has accepted it will never rival Facebook or Twitter again. However, it could potentially cement its position as a secondary site like Pinterest and some of the new features, as well as its design could really aid this expectation. If all goes well it could be a great place for listeners and performers to meet. This is all added to by its clear, of the moment style which will endear it to the cooler among us undoubtedly. News of a mobile app hasn’t been forthcoming, which could be an oversight. However, we await full launch and can’t wait to give it a try having signed up for an invite. 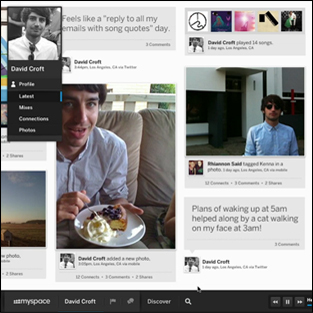 What do you think of the new MySpace?